Fifteen Restaurant by Jamie Oliver opened its doors in 2002 with a view to mentoring underprivileged youth and giving them prospects for a future. The scheme revolved around a cooking apprentice training programme to create chefs of the future. Ten years later, and with branches in Cornwall, Amsterdam and Melbourne, Fifteen has seen over 350 students graduate, about 80% of which have continued to work in the food profession. Admirably all the profit from the restaurants gets donated to the Jamie Oliver Food Foundation. The original Fifteen is in Shoreditch and it is a handsome looking restaurant. Split over two floors, the décor is dark; dark tables, dark floors, etc, made even darker as the sunlight goes down as the lighting is kept very dim. But it sets the tone for an intimate atmosphere made buzzier by the constant chatter of the guests. Tables are closely positioned, but the space works. Fifteen delivers a daily changing ‘British’ menu. It’s seasonal, cleverly constructed, and is based on whatever is in fresh and available from suppliers that day. Unlike standard à la carte menus, the menu isn’t split between starters and mains. Instead everything is listed on one long list, although in principle there are about eleven starters and five main courses. It’s a sharing feast and the dishes are brought out as and when they are ready, although you may request that they be brought out in a certain sequence. The beef and barley bun with a horseradish cream (£5) has to be one of the nicest things I have ever eaten in my life. Consisting of a donut dough baked with a filling of minced beer, barley and pickled walnuts, it was stupendously good. The dough was soft and moreish, and the contrasting textures and flavours of the filling went hand in hand with the lightness of the bun. 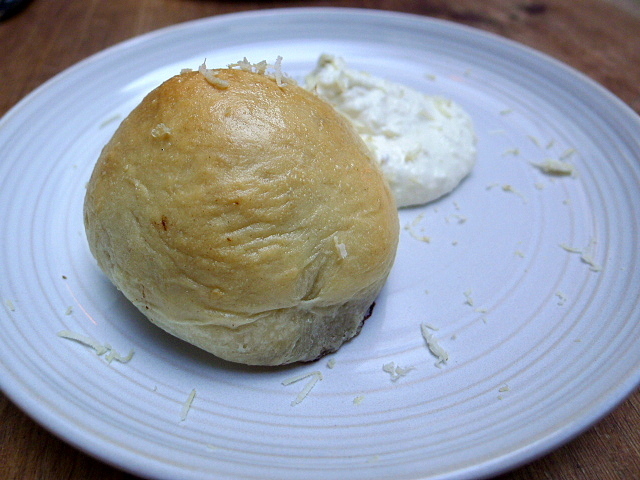 The horseradish cream was also excellent, and with the use of both horseradish ‘juice’ and grated horseradish, it had that extra special little kick that matched with the flavours of the bun really well. Cured wild sea bass (£10) was fresh, spritely and easy on the palate. 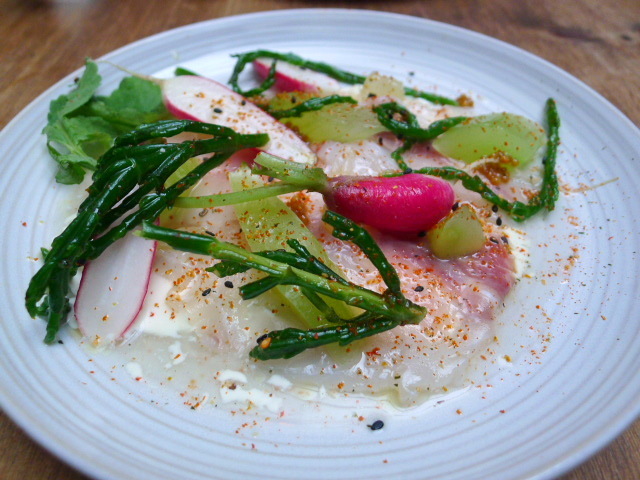 A complex combination of ingredients had been used to accentuate the sweetness of the fish including togarashi for a touch of spice, raw radishes for a bit of crunch, sea purslane for some saltiness and pickled cucumber for a hit of acidity. Served on a bed of creamy yoghurt, this was a fine, fine plate. 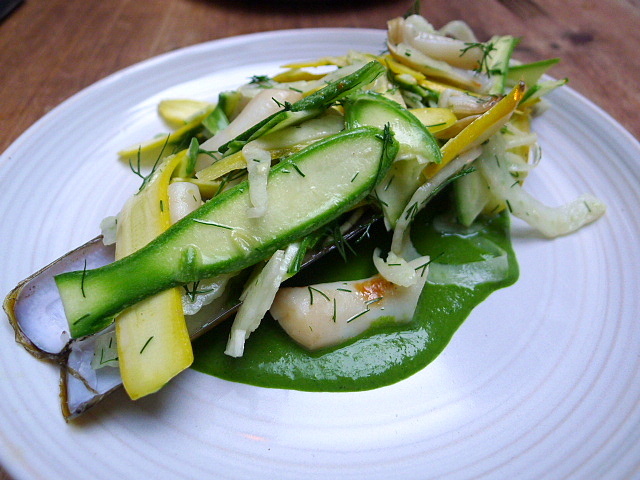 A dish of grilled razor clams with courgettes and herb vinaigrette (£10) was also very appetising. The clams were tender, and the courgettes were perfectly cooked with a little crunchiness to them. The vinaigrette consisted of tarragon and parsley for a summery freshness. 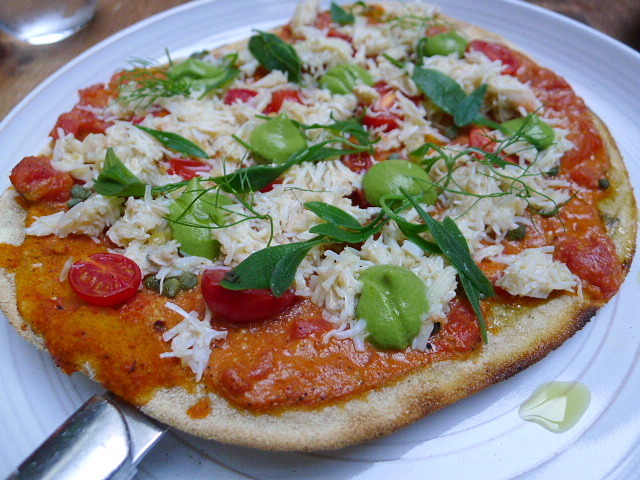 I adored the originality of the dish of Dorset crab on rye flatbread with tomato and wild fennel (£13) which tasted like a glamorous crab pizza. The crab was lovely and sweet and perched on the thinnest and crispiest of freshly baked rye flatbreads. The harmony of flavours was also well judged with saltiness coming through from the olive puree and sea purslane leaves, and sweetness oozing from the cherry tomatoes. The result was a classy pizza-like effect. Bocca di lupo (£15) were little pasta parcels filled with smoked ricotta and topped with an egg yolk confit (cooked at 60c), summer truffles and a dreamily creamy sauce of potato and Lincolnshire poacher cheese. The pasta was cooked al dente and it merged wonderfully with the hearty flavour of the cheesy sauce. 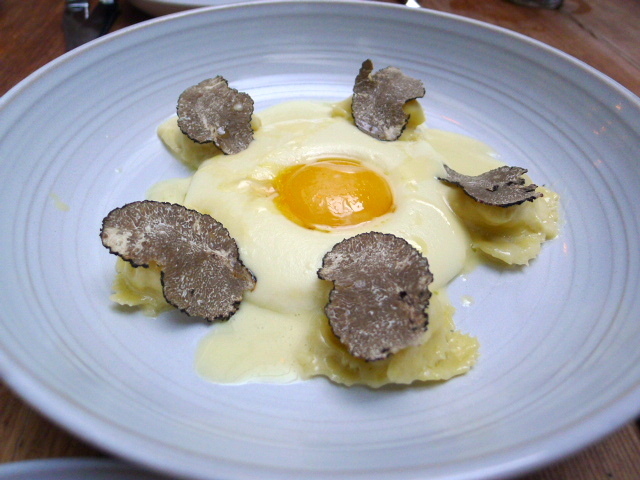 The shavings of truffle were also generous. Violet artichokes and shallots (£13) had been roasted such they were soft and sweet although the artichokes were a little chewy on the outside. 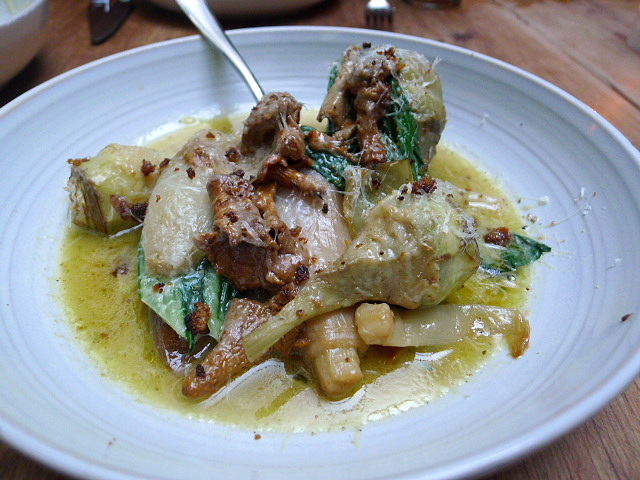 Served with girolles and shavings of Berkswell cheese. This was a simple but tasty dish. 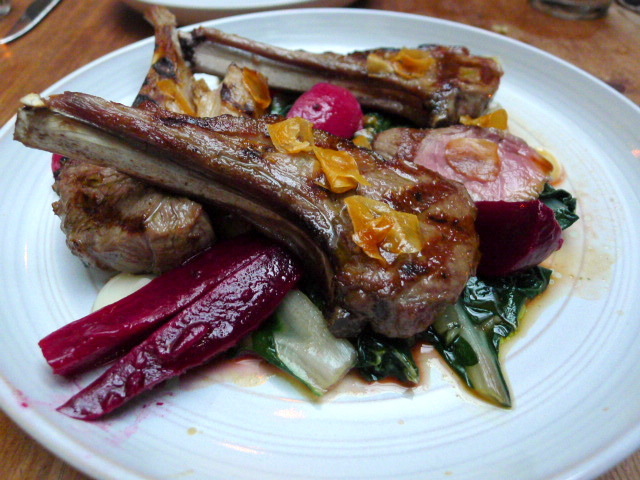 Lamb chops (£24) had been cooked medium rather than the requested medium rare. That said it did not detract from the tastiness of the lamb. Accompaniments including sweet beetroot, earthy chard and new season garlic served as crisps and in a purée form rounded of yet another winning dish. Hazelnut madeleines (£8) were delicious, warm and scrumptious, especially when eaten with the Frangelico cream. An apricot tart with Ivy House cream (£6) was good too, and resembled an apricot tarte tartin with its flaky puff pastry. We found the service to be excellent and attentive, although the drinks were slow to arrive. This had less to do with the service then the turnaround times at the bar. Not only was the execution of the cooking excellent, I couldn’t help but also applaud the wonderful quality, seasonality and provenance of the ingredients as well. And there was also much to like about the thoughtful composition of the menu. Head chef Jon Rotheram did a stellar job of satisfying our bellies for what was a pretty fault-free meal. And those barley buns were simply to-die-for. Price range: £31 to £47 for three courses, excludes drinks and service.